Joseph Gibson was an Average Adjuster and Marine Insurance Broker in Dundee, who was prominent in the shipping and whaling industries. He held a number of public and charitable positions and left an estate then valued at almost £87,000. 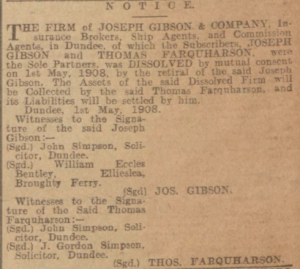 The Dundee Postal Directory first provided an entry for Joseph Gibson in 1856-57, working on his own account, as a 'marine insurance broker and average stater.' His business operated at that time from 19 Dock Street. Similar listings continued up to the point where he pledged his subscription for the building of the Albert Institute. Joseph Gibson was born in Dundee in 1830. 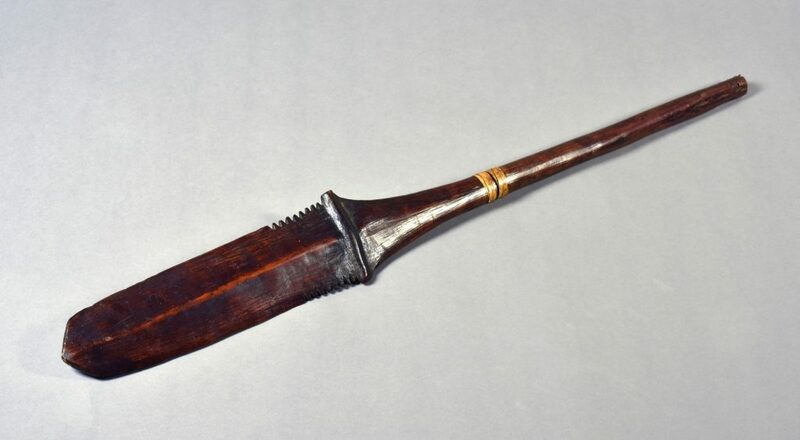 He was the son of Joseph Gibson, a jute manufacturer and his wife, Margaret Boath. 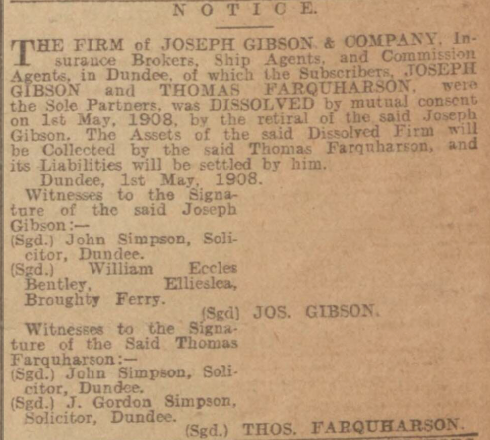 By profession, Joseph Gibson was an “average adjuster and marine insurance broker,” who became the senior partner in Messrs Joseph Gibson & Co. Joseph’s partner in the business happened to be his brother-in-law, Thomas Farquharson. 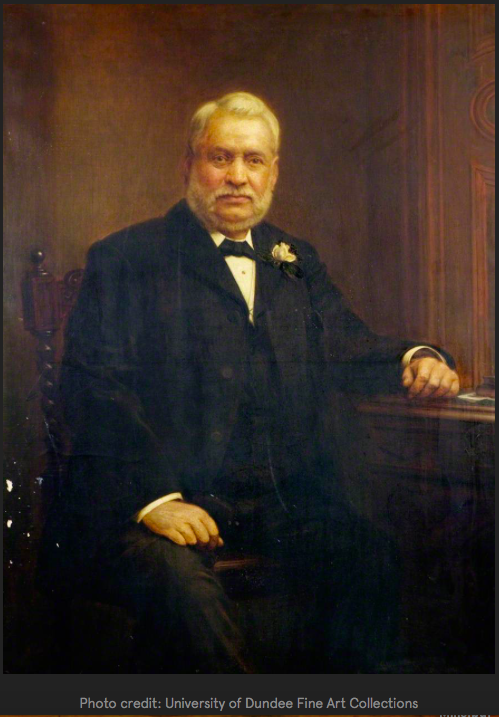 Their partnership was dissolved, with mutual consent, in 1908 by Joseph’s retiral. He served as a Justice of the Peace and held a number of other influential, social and charitable positions over the course of his lifetime, including being President of the Chamber of Commerce, a Director of Dundee Royal Infirmary and President of the Dundee Seamen’s Friend Society. Gibson was a member of the West United Free Church, Brook Street, Broughty Ferry, where he served variously as Elder and Session Clerk. Joseph Gibson was a man of wealth and influence, involved in overseas trade and development at an important time for the British Empire. Having been a business leader, including President of the Chamber of Commerce, he was influential in the development of Dundee at a significant period in its history. Having held the position of Justice of the Peace, he was a man who also had a strong sense of civic duty. 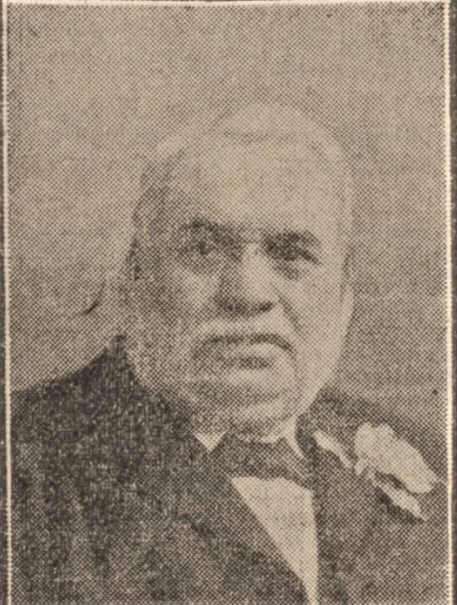 He was active in supporting charitable institutions to benefit the poor of Dundee, including the Dundee Royal Infirmary and Dundee Seamen’s Friend Society. 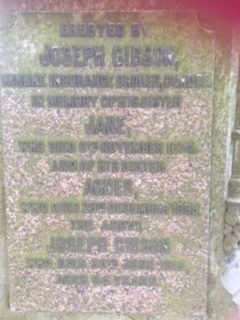 Joseph Gibson lived for a time with siblings, Jane, Margaret and Jessie, at 12 James Place, Broughty Ferry and then at Bay Cottage, Broughty Ferry. By 1878, he was living with servants at Ellieslea, Broughty Ferry, a 10 room mansion. Joseph Gibson died at his home, Ellieslea, Broughty Ferry aged 84, on 30 June 1915 . His death was registered by his nephew William Gibson. At the time of his death Joseph Gibson had holdings in a number of whaling, shipping and other companies connected with Dundee’s maritime industries. He also held interests in the jute industry, rubber estates, land development and mining companies, together with banks and insurance companies. 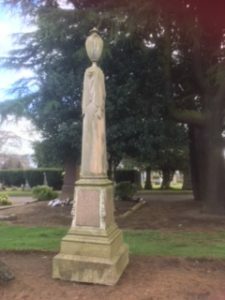 After a number of legacies ranging in value from £100 to £8000, he left the residue of his estate to his nephew, William Gibson, who is believed to have been living with his uncle at Ellieslea, Broughty Ferry, at the time of his death. Old Parish Registers. Dundee. Births. (1830). 282/ 160 320. ScotlandsPeople website. 1861 Census. Scotland. Dundee. First District. 282/01. ED35. ScotlandsPeople website. Dundee Postal Directory, 1856-57. Dundee Central Library, Local Studies. 1871 Census. Scotland. Dundee. 282/4. ScotlandsPeople website. 1911 Census. Scotland. Dundee. 282/4. ScotlandsPeople website. Statutory Registers. Dundee. Deaths. (1915). 282/4 851. ScotlandsPeople website. Dundee City Council Burial Records. Dundee Eastern Cemetery. Dundee Courier. Thursday, July 1 1915. 'Death of Mr Joseph Gibson Dundee.' British Newspaper Archive website. Dundee, Perth & Cupar Advertiser. 5 February 1856. Findmypast website. Dundee Courier. 9 November 1869. p.2. Findmypast website. Dundee Chamber of Commerce. (1936). Centenary Souvenir. Dundee. Burns & Harris. Dundee Directory, 1882. Friends of Dundee Archive, General Directory. Dundee Directory, 1896. Friends of Dundee Archive, General Directory. Dundee Postal Directory, 1878-79. Dundee Central Library, Local Studies. Wills and Testaments. Dundee Sheriff Court. (1915). Reference SC45/31/77. ScotlandsPeople website. The information above about Joseph Gibson has been collated from a range of digital and hard copy sources. To the best of our knowledge it is correct but if you are relying on any information from our website for the purpose of your own research we would advise you to follow up the sources to your own satisfaction. If you are aware of an inaccuracy in our text please do not hesitate to notify us through our Contact page.